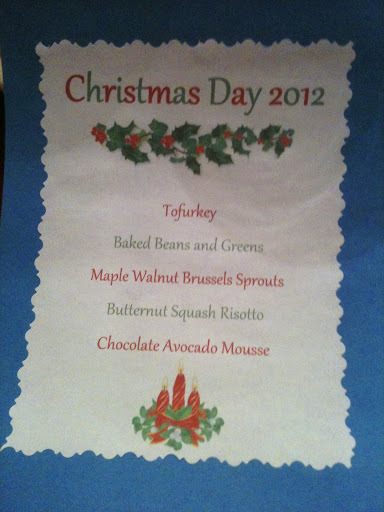 The tofurkey was a store bought one from Trader Joe’s. It contained wheat ingredients so I did not eat that dish. My main dish was the Baked Beans and Greens. I am so happy there were leftovers of this dish because I enjoyed this dish a lot! In fact, I think by the time I ate all the leftovers, I probably ate most of the dish myself. In a medium pan, combine beans and enough water to completely cover beans by several inches. Bring to a boil, remove from heat and let sit for 30 minutes, covered. In a large skillet, heat oil over medium-high heat. Add onion and cook until browned, about 6 to 7 minutes. Stir in carrots, celery, and garlic and cook about 2 more minutes. Stir in tomato paste and cook about 1 minute. Stir in greens a little at a time. Drain beans and add to the skillet. Stir in the vegetable broth, cayenne pepper, and salt. Pour the mixture into a 9×13 inch casserole dish and cover with foil. Bake until beans are tender about 1.5 to 2 hours. (It will depend on the type of beans you use). In a small bowl, combine Parmesan and parsley. When the beans and greens are done baking, sprinkle on the Parmesan and parsley mixture. Bake, uncovered, for about 10 more minutes. Based on using red kidney beans, kale, and Galaxy Nutritional Foods vegan Parmesan Cheese, 1 serving yields approximately 157 calories and 11g protein. Last but not least, Christmas Eve ended with dessert! I love apples. I’ve always wanted to try an apple crisp but usually when I just bake an apple for myself it is always easiest just to chop one apple, bake it, and sprinkle it with cinnamon. A perfect snack/dessert on a cold winter’s night. However, it is not an apple crisp. With all the dishes that were made for Christmas Eve, I wanted a lighter dessert that would be more on the healthy side. Since I was making dessert for the family, I knew this would be a perfect time to try out a real apple crisp. Preheat oven to 350F. Lightly grease an 8×8 glass baking pan. In a large bowl, toss sliced apples, cinnamon, nutmeg, and 1 tbsp of agave. Pour apple mixture into glass baking pan and bake for 10 minutes. When the apples are ready, remove them from the oven and sprinkle the topping mixture over the apples. Place back in the oven and bake for 20-25 minutes, or until golden brown. You can enjoy this right away, or top with Coconut Ice Cream for Apple Crisp A La Mode.This was a very easy dessert to make and the entire family absolutely loved it! I cannot wait to bake it again! In fact, I was so excited to try it myself that I forgot to take a picture. Good thing I plan on making it again and will post a picture in the future. Based on using Fuji Apples, Bob’s Red Mill Gluten Free Rolled Oats, and agave, 1 servings yields approximately 293 calories and 4g protein. The next side dish I made for Christmas Eve dinner is Cauliflower Mashed Potatoes with Sage Gravy. This is a great mashed potatoes recipe to sneak in some vegetables. It is much healthier than the traditional mashed potatoes, but since it is not all cauliflower and does include some potatoes, it is still very creamy and tastes just like regular mashed potatoes. Wash and cut potatoes into 3/4 in. pieces. Place the potatoes in a large pot and cover with water. Make sure there is about 4 inches of water on top for when you add the cauliflower. Bring the potatoes to a boil. Once boiling, add the cauliflower and lower heat to a simmer. Let simmer for about 15 minutes, or until the potatoes and cauliflower are tender. Drain them in a colander and return to the pot. Use a potato masher to mash them to desired texture. Add the rest of the ingredients to season, stirring to evenly combine. Taste and adjust seasonings to taste. Based on just the cauliflower mashed potatoes without the optional nutritional yeast and without the gravy, 1 serving yields approximately 114 calories and 3.5g protein.If you include the optional nutritional yeast, not including the gravy, 1 serving yields approximately 149 calories and 7.5g protein. The next dish I made for Christmas Eve was a Broccoli and Rice Casserole. Preheat oven to 375F. Lightly spray a medium casserole dish (about 2 1/2 quart size). Place the sauce ingredients into a blender and process until smooth. Set aside. Place the broccoli in a steamer basket set over warm water and steam, covered. Cook for about 3 to 4 minutes or until just barely tender, then remove from heat. In a large, deep saute pan, add the onion, bell pepper, and celery and cook for about 4-5 minutes, stirring constantly. Stir in the chickpeas, thyme, rice, and steamed broccoli. Give the sauce a quick stir to make sure it is well-blended, then add it to the skillet. Stir gently and cook until heated through, about 5 minutes. Check seasonings and adjust to taste. 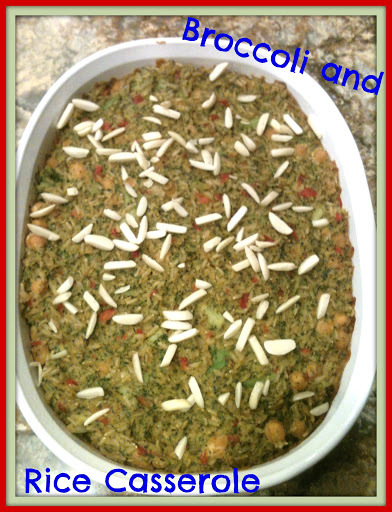 Smooth into the prepared casserole dish and sprinkle with almonds. Bake about 20 minutes, until the top begins to brown. *You can sub chickpeas for baked and cubed tofu or tempeh. For this dish, I used the chickpeas and left out the tahini. I am curious at using tofu and tempeh as the protein source and will probably try those variations out in the future. Everybody really enjoyed this dish. I forgot to add the almonds, which is why my almonds are so white in the picture above. They were still good, but I think they would have been even better if I remembered to add them in before I started baking this dish. Oh well, next time! This recipe makes 12 side-dish sized servings. Based on using chickpeas and no tahini or cashew butter, 1 serving yields approximately 173 calories and 10g protein. 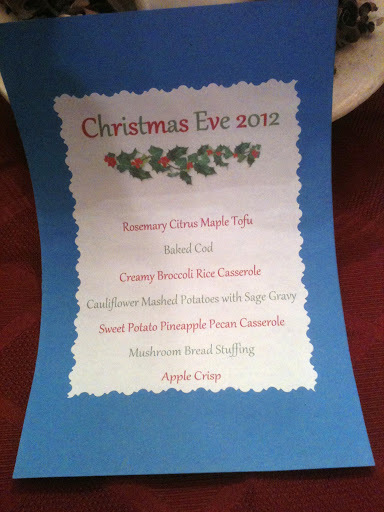 I have so many delicious recipes to share that I enjoyed for dinner on Christmas Eve. Besides the baked cod and the mushroom bread stuffing, everything was vegan and gluten free and since the vegan and gluten free meals are the ones I made and enjoyed, those are the meals I will be sharing over the next few days. 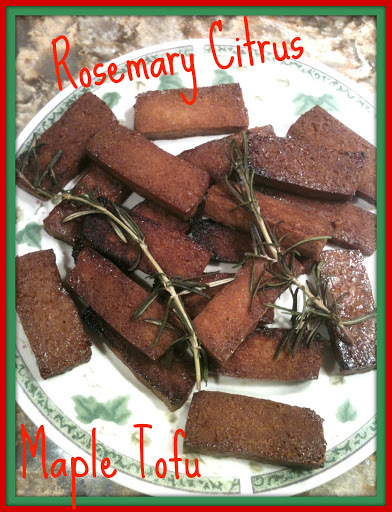 First up, the main entree on Christmas Eve, the Rosemary Citrus Maple Tofu. Press tofu to remove all moisture. If desired, freeze the night before for a different texture and allow to thaw before marinating. Combine all marinade ingredients in a shallow bowl. Slice tofu into equal pieces (I made 20 slices.) These can be cut in rectangles or triangles. Allow to marinate for at least 2 hours or overnight. Preheat oven to 375F. Line a baking sheet with foil and spray with non-stick cooking oil. Place tofu on the pan without overlapping and bake for 20 minutes. Remove tofu from the oven, flip, and spoon the rest of the marinade on top. Place the tofu back in the oven for another 10 minutes. After 10 minutes, broil for about 3 minutes for a chewier texture, if desired. Based on making 20 slices of tofu, 1 serving (or 5 slices of tofu) yields approximately 220 calories and 15g protein. Muffins are probably one of my favorite things to bake for several reasons. First, you can enjoy them throughout the day. Muffins are great for breakfast, snacks, or dessert. You can also crumble a muffin and add it to a yogurt bowl. You can even add different toppings to muffins like peanut butter, jelly, icings, or other frostings. Second, they freeze well. If you live alone and can’t eat them all or want to make a double batch so you have some already made for in the future, you can just individually wrap them in saran wrap, put them in a ziplock bag, and keep them in the freezer. Then you can take one out the night before to thaw, or if you want one immediately you can simply reheat it in the microwave or oven. 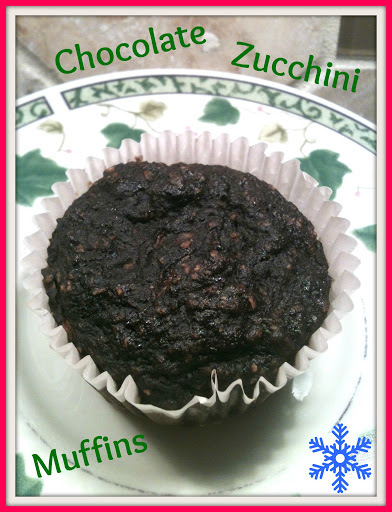 Third, you can easily get some fruits and veggies from muffins and this recipe is one example of how to get some veggies into your muffins using zucchini. 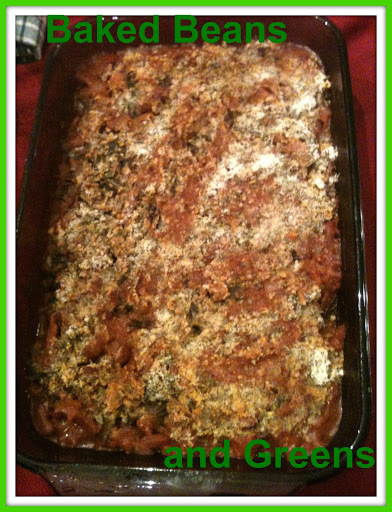 This recipe was adapted from Happy Herbivore. I made some changes to the original recipe to make them gluten free. Preheat oven to 350F and prepare muffin pan with paper liners. Whisk together flours, cocoa, baking powder, baking soda, salt, and cinnamon in a medium bowl. In a small bowl, cream banana with the raw sugar and applesauce. Stir in almond milk, vanilla extract, and zucchini. Add flour mixture to wet ingredients in small batches, stirring until just combined. Spoon batter into prepared muffin pan and bake for about 25 minutes, or until a toothpick inserted into the center comes out clean. Of all the muffin recipes I have made, these are by far my favorite. 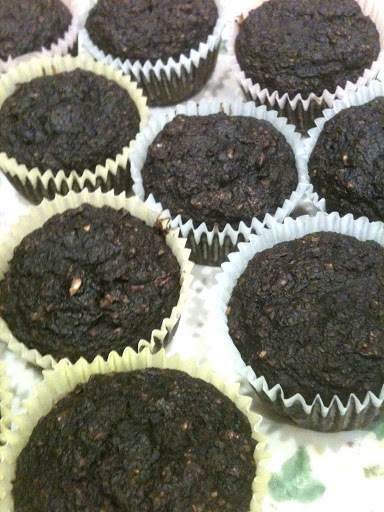 They were moist, soft, and cake-like and even though they are chocolate, they have banana and zucchini, no oil, and only 1/2 cup sugar, so they can definitely be enjoyed at any time of the day with no-guilt. 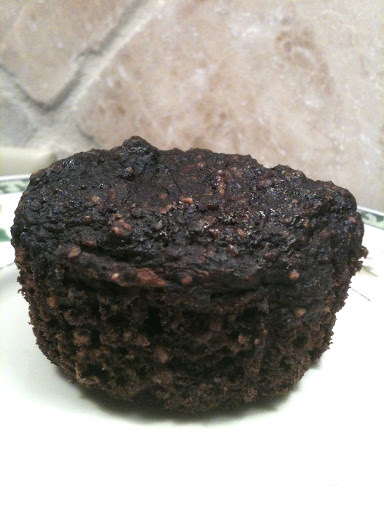 Based on using Bob’s Red Mill brand for the oat flour and sorghum flour and original Silk PureAlmond Milk, 1 muffin yields approximately 98 calories and 3g protein. I was really in the mood to make some patties for dinner and so that I would have extra for ready-made lunches for the next few days. Normally I make these typical Black Bean Patties but I really wanted something different. 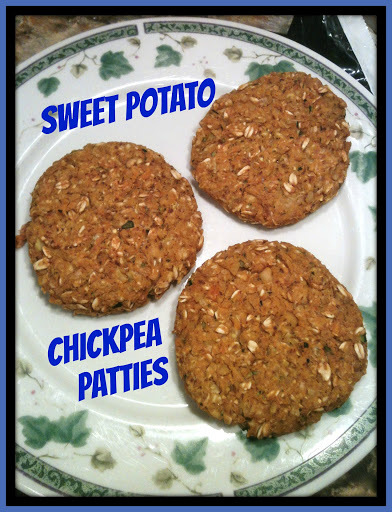 I was reading around on the internet and saw that sweet potatoes and chickpeas were two common burger ingredients. However, all the recipes I came across called for all these extra ingredients and I really wanted something that would be quick and easy. I decided to take a risk and basically follow the black bean patty recipe but sub in sweet potato and chickpeas. I also had half a zucchini from a recipe I made earlier (it will most likely be the next recipe I post) so I decided to add that for some veggies. Mash chickpeas with a fork until desired texture. Alternatively, pulse for a few seconds in a food processor, or until desired texture. (I like some whole pieces of beans in my patties). In a medium bowl, combine chickpeas, sweet potato, grated zucchini, oats (pulse in a food processor for a few seconds to turn rolled oats into instant), flaxseeds, and all seasonings and spices. Mix until well combined. With your hands, form 6 patties and place on the baking sheet. Bake for 15 minutes, flip carefully, and then bake for another 15 minutes or until crispy on both sides. You can bake the sweet potato in the oven or the microwave depending on how much time you have. I used the microwave and it came out fine, though it probably would have been better in the oven.I loved the zucchini added to this mixture. I’m definitely going to be making this meal again and next time I want to experiment with different kinds of veggies (or a mixture!) and maybe even some different seasonings. 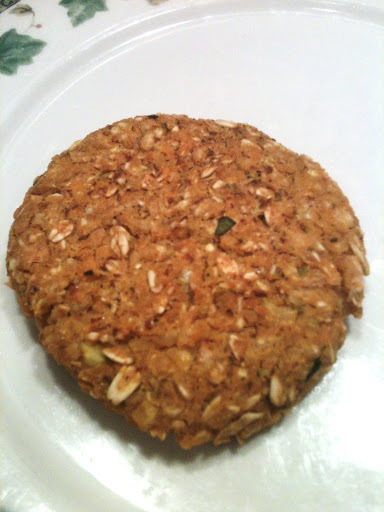 Based on forming 6 patties using Bob’s Red Mill Gluten Free Rolled Oats and Goya Chickpeas, 1 patty yields approximately 129 calories and 6g protein. One of my favorite desserts to make is this Chocolate Avocado Pudding. Whenever, I am craving something sweet and chocolaty, but want to keep it healthy, this is the dessert I turn to. The avocado gives it the perfect creaminess and the chocolate gives me the sweet flavor I am craving. I recently came across a recipe that included a banana into this pudding. I love bananas and could just imagine the extra creaminess and sweetness this fruit would give the pudding. Plus, the recipe includes cinnamon and that is one of my favorite spices; especially this time of the year! In a food processor, blend avocado and banana until smooth. Add in the rest of the ingredients and continue blending until everything is incorporated, scraping down the sides of the processor as needed. Pour into 2 dessert glasses and refrigerate for at least 1 hour or overnight. The longer this pudding sets, the thicker it gets. I also think the banana flavor merged in perfectly the longer it set as well. I loved the hint of banana in this pudding! I can’t wait to make this delicious treat again!This recipe makes 2 servings. Based on 1 serving, this recipe yields approximately 204 calories and 3g protein. Happy Monday! 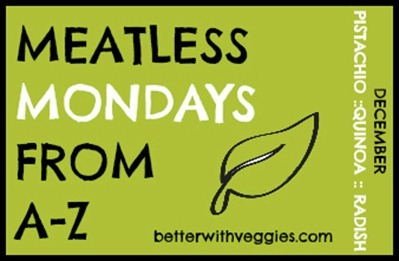 This week for Meatless Monday’s From A to Z we are on the letter P for Pistachio. I love pistachios, though I do not eat them nearly enough. Usually I eat them at my grandparent’s house when we’re all sitting around and there’s a bowl of them out on the table. Now that I went out to buy a big bag for this weeks recipe, maybe I’ll start snacking on them more. They are such a heart healthy nut! I really wanted to try to make a pudding with the pistachios because that just sounded so tasty. But I would have had to put more thought into that and unfortunately did not have time. Maybe another day I can try out a pistachio pudding. I also thought about making a pistachio pesto sauce to put over noodles. But late Saturday night as I was making dinner, I really didn’t want to experiment with different spices and possibly not like my pesto sauce (I either love or hate certain types of pesto). 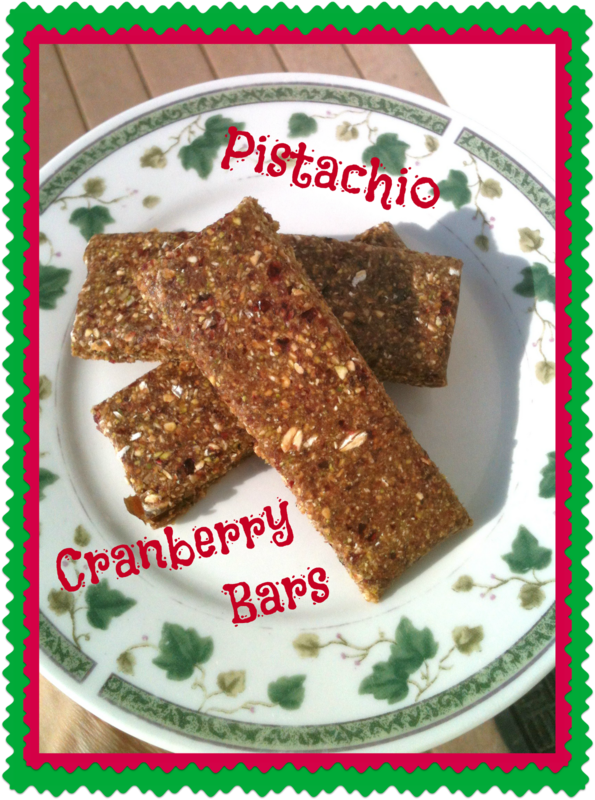 Then, I came across a recipe that had pistachios and cranberries! Those two ingredients together sounded absolutely amazing. Unlike the original recipe, I turned these into bars. I wanted to have a portable healthy snack ready to go for school or work. I also omitted the cocoa powder. I was all set on adding it, but once I mixed the other ingredients, it looked so pretty I didn’t want to add a brown color. I’m sure the chocolate flavor would be amazing though and definitely want to try it next time. Soak dates in warm water for about an hour. Alternatively, heat in the microwave for about 20 seconds. Roll dough into a big ball and place on wax paper. Lay another sheet of wax paper on top of the dough ball. Roll dough out to form a big rectangle. Cut into bars, wrap individually in wax paper, and store in the fridge. (I was able to make 6 bars). * I mixed all my ingredients in the food processor for about 15 seconds, then I removed half the dough and set it aside in a bowl. I then continued to mix the remaining dough for a little longer. This allowed half the dough to get really smooth and the other half to get mixed together but still had a lot of texture. I then combined both sets of dough for a smooth bar with some crunch! It worked perfectly! I love the healthy, natural ingredients in this bar! Based on 6 bars, each bar yields approximately 147 calories and 3.5g protein. 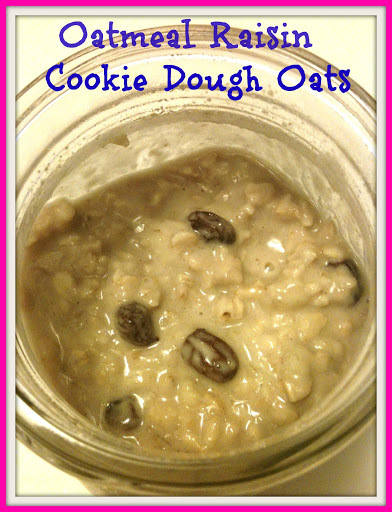 I haven’t posted an oatmeal recipe in a while and considering how often I eat oatmeal, I really would like to expand my collection of my favorite recipes on here so I can easily make them again. This recipe was very creamy and had a delicious natural sweetness to it which came from the raisins. 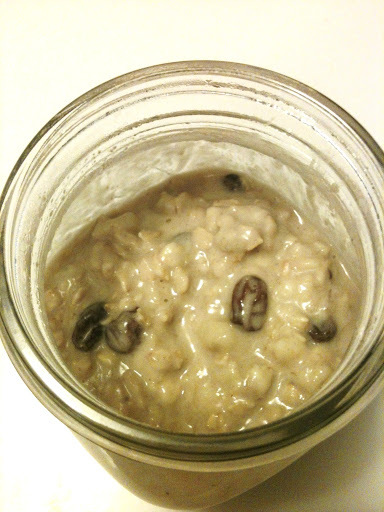 Once again I prepared this overnight to add volume to the oats, and have it ready to go in the morning. However, this time I added a splash of almond milk in the morning because I was in the mood for a more creamy oatmeal rather than a thicker oatmeal (that’s unusual for me haha). Directions: Combine all ingredients and heat for a minute in the microwave. Alternatively, prepare the night before, refrigerate, then eat cold in the morning or reheat. If desired, pour additional almond milk over top before eating. Based on using Trader Joe’s Gluten Free Rolled Oats, Silk PureAlmond Milk, and Peanut Butter & Company Mighty Maple Peanut Butter, this recipe yields approximately 335 calories and 7.5g protein.